Im currently building a watercooled hackintosh and would like to use the Aquaero 5. Does anyone know if this would work with MAC OS X? No, the aquasuite only runs on Windows XP and above. Of course you can also use the aquaero XT without the software since all options are accessible through the device itself. 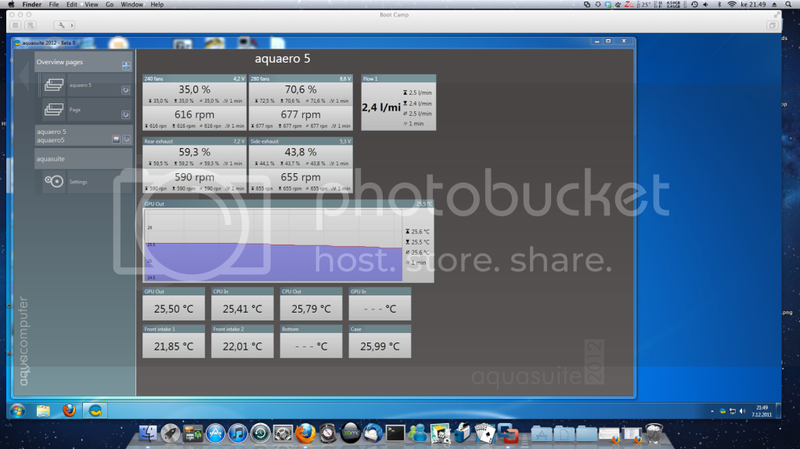 You can also run Aquasuite on a virtual Windows machine, this is my system running Aquasuite on virtual Windows 7 machine from OS X Lion. NICE! Totally didnt even think of that. Whats youre setup? Gigabyte GA-Z68XP-UD4 & i7-2600K & Radeon HD6870 running OS X 10.7.2. Watercooling gear is controlled by AE 5 LT and a PA2.